MD10 White Silky Shampoo - Professional grade dog shampoo. 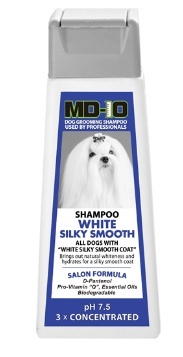 For all white smooth coats. Blue colour element DOES NOT STAIN the coat. Instead this element reflects the light. Therefore it works well with black and white dogs giving maximum contrast. Maltese, Japanese Chin, Papillon, Cavalier King Charles Spaniel, Springer Spaniel, Setter, Dalmatian, also good for Shih Tzu, Lhasa Apso and more.